After the last two blog posts perhaps a simple and straightforward post concerning the beer in question is in order ? These are always in the beer cooler at my favourite, if you have not guessed by now, local corner shop. 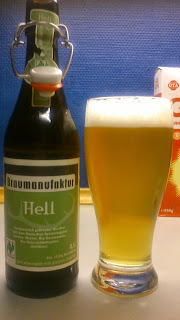 Hell comes in a swing top like all their other beers and pours a slightly hazy dark yellow to gold with a white head. Mildly sweet on the intake with malt, caramel and butter. The finish is very mild bitter hops and grass. Nothing much in the aftertaste apart from a tiny bit of hop bitterness. Middle of the road helles/pils with no great surprises and no huge complaints either. My main gripe is I have drunk this fresh and it is a lot better, well that is not a great surprise really. Another that I'd not buy again but would not say no to one if offered. If the opportunity came up to try it fresh again then 'Yes please'. Quite an average run of the mill brew and scored 3.5/10 on the 'organic does not always equal great' Beerometer. Like the Hell above this is an organic, no aroma worth mentioning on the pour above though there is a very faint aroma of yeast and a light buttery malt from this. 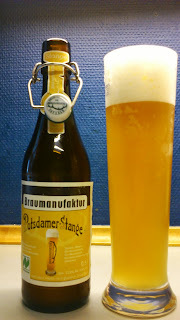 Potsdamer Stange pour a cloudy yellow to orange with a big thick creamy white head. Malt, wheat and and that buttery taste on the moderately sweet intake while the finish is mildly bitter and dry. In the aftertaste a fruity syrup and again that faint taste of butter. Nice and smooth mouthfeel with this. Quite an unusual tasting beer though the diacetyl is perhaps a bit too much. Neither great not bad I quite enjoyed it as it is very easy drinking. I have bought it a few times now and my main gripe with it would be the diacetyl butter taste seems to vary from batch to batch though maybe that is just my imagination. Sometimes you notice it more, sometimes less. This scored 4/10 on the 'I can't believe that's not...'Beerometer.